2010 plus 23 (2033): All the best "real time" greetings and "From Ruhr with Love"
Visible Realtime Video Weather Informations for 5,3 Mio. Inhabitants and World Visitors. Welcome to the futurized year of the upcoming cultural unique year of 2010 events: RUHR_LIVE to Culture, Parties, Events and the European Capital of Culture Ruhr 2010 Live Views (+ 22) - Regione Ruhr Germania - from the "Ruhr Metropolis" Mega City with Road Map of Peoples Life Convenience Live Webcam Images and World Mega City Pics of NRW (North Rhine Westphalia). „metropoleruhr“ belongs to the largest and economically most important centres in Europe. Also Germany with the "Geo Surfer Visual Live Christmas" and New Years Eve Webcam Guidance 2007/2008. 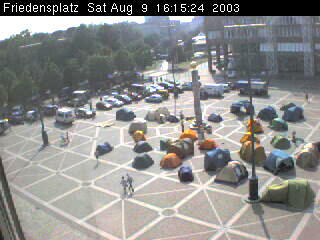 Find Ruhr Valley Hotels via the Visual Webcam World of the Largest German Area Ruhr with 111! Public Live CCTV City Webcams (partly "livescope" cams) from the West German Greater Ruhr Capital, a German Metropolis (Metropol Region Allemagne Ruhr), largest German Industrial Mega City. Ruhr City is embedded inside the Ruhr Valley between the Rivers "Ruhr" in the south and "Lippe" in the north. Also draw the Ruhr Valley Towns through the River "Emscher", crossed the country from south to north flewing inside the Large Main River "Rhine". The Region is mentioned as "Ruhr Valley" and appears in this City Guidance Visual Network Ruhr.tv with all life live city webcams and further infos, also to the "Culture Capital Metropolis 2010+22". The so called "Ruhr Pot" presents itself live viewable inside the nearly 7 years existing Ruhrcity.net, and you can find all web cams from the outer west of Germany with 5.269.423 Ruhr citizens and inhabitants +Info +Video +Geo data! The current weather situation of Ruhr is here live to see as "webcam forecast" - 24 hours a day / 8 days the week... Also public video streams are offered via the internet. Bicycle riders and Motor drivers can plan their trips with weather forecasts in the Ruhr area. Today the Metropole Ruhr weather webcams and aerial pictures as well as images and pictures of Ruhr with its river enhance your view to this German region. The list of all unique 53 Ruhr Cities from Ruhr Metropolis (Ruhr Valley) of the Ruhr Region Federation can be found here: Alpen, Bergkamen, Bochum, Boenen, Bottrop, Breckerfeld, Castrop-Rauxel, Datteln, Dinslaken, Dorsten, Dortmund, Duisburg, Ennepetal, Essen, Froendenberg, Gelsenkirchen, Gevelsberg, Gladbeck, Hagen, Haltern, Hamm, Hamminkeln, Hattingen, Herdecke, Kamera Herne, Herten, Holzwickede, Huenxe, Kamen, Kamp-Lintfort, Luenen, Marl, Moers, Muelheim, Neukirchen-Vluyn, Oberhausen, Oer-Erkenschwick, Recklinghausen, Rheinberg, Schermbeck, Schwelm, Schwerte, Selm, Sonsbeck, Sprockhoevel, Unna, Voerde, Waltrop, Werne, Wesel, Wetter, Witten und Web-Cam Xanten. Click "RUHR GEO DATA" - the server for Ruhr street maps and aerial Ruhr valley pictures! RUHR.TV: Innovative future Ruhr Marketing with currently 111 City Webcams - and growing! NEW: Complete List of all 214 International Partner Cities of the Ruhr Valley Metropolis: Click here! The New Year Eve December 2008 LIVE Cameras From West Germany Invite You To Join This Great German Metropolis. Hey Ruhr! "I love you pure!" Webcams Werne at River "Lippe"
Dortmund Inner City Centre Webcam: Skyline Weather City Webcam, Old Market Camera, Hansa Square (Hansa Market), Friedensplatz (Peace Square [Friedensplatz] Dortmund at Football World Championship FIFA2006 City), East and South Rampart "Suedwall", Reinoldi Reinoldi Cathedral, Webcam Reinoldi Square (Ostenhellweg), Main Station Webcam, Micro Festival Live, Museum Night Live, Night of Ruhr Industrial Heritage Webcams, Syburg Casino (Hohensyburg) and Harkortsee Ruhr Cameras (currently OFFLINE!). Centre South-West Webcam: Camera District "Kreuz Quarter" at Cross Street, Interactive Livescope Webview Sunrise and Sunset Webcams at Rhine Land Dyke Motorway A40 / B1, Borussia Dortmund (FIFA WM 2006) Autobahn Interactive Webcam at BvB Administration Dortmund (http://borussia.../-wvhttp-01-/GetStillImage), Searching German Steigenberger Maxx Hotel Webcams. DO-South-Centre Webcams from the World Cup Boulevard High Str. into direction South and North. Dortmund-North West Webcam: Huckarde Rahmer St. Market Place Webcams (sometimes with Funfair), A2 Autobahn, Mengede Webcam. Dortmund Webcams West: Luetgendortmund, Dorstfeld, Marten, Oespel (Dorney), Barop, Eichlinghofen, Searching Parking Space Webcam Industrial Park / IKEA. City Webcam: HA - Eilpe, Neue City Sparkasse (Stadtsparkasse Webcam), Herrentisch, Boele, Yacht School Harkort See at River Ruhr (Segelschulen Webcam). NEW FREE LIVE WEB CAMERA: Hagen-Haspe Landscape View in Direction Hagen-Centre. Railway St., Main St., Webcam Interactive (controlable) View of the Culture Centre at "Holsterhauser Street" and Archeology Museum Home Heritage Museum, Herne - Webcam City Centre Culture Center at Holsterhauser Str. (second camera also "controlable" with views on industrial plant system buildings) - Crange fair bustle webcam. Funfair Cranger Fairground Webcams, Wanne-Eickel: Cameras Mainstreet, interactive webcam "Sassenburg", Magdeburger St.
High St., "Arena on Schalke" Stadium Field Webcam (Schalke04 Stadion Camera, Football World Championship WM 2006 Webcams), Gelsenwasser - Dept. of Work Camera, Traffic Cameras (Ruhr Valley Traffic Cams): Roland-St., Ring-St., Emil Zimmermann Allee, Gelsenkirchen North Ring. Zoo Animal Webcams Gelsenkirchen. Fire Fighter Webcam - interactive camera - at the Main Fire Department in Essen-East Quarter. University Essen-Duisburg Webcam, Autobahn Motorway Webcams Essen-City Centre (Webcam RWE Skyline) plus Camera interactive controlable at Cinemaxx Cinema Center Berlin Square, Kennedy Square, "Ruhrschnellweg" Motorway Exit Essen Centre A40 / A52 Direction Dusseldorf Autobahn Traffic Webcam South/East Quarter, Kaiserhof-St. Storp-St. "STORP 9" Krampe-St. / Oberschlesien-St. (Camera EVAG Station Bus Trace), Frohnhausen, Essen Webcams Kupferdreh, Bredeney Railway Station Webcam, Kettwig, Ruhr Valley Cameras, Outdoor Camera Velbert. City Inner Centre Horse Market (Pferdemarkt) cctv Video Camera, Ruhr Area Traffic Cameras, Webcams: Prosper-St., Gladbecker St., Osterfelder St., Webcam Picture of the Thetraeder at Bottrop Pithead Stocks. City: Town Hall Panorama at Willy-Brandt-Square with Lamberti-Tower, Traffic Web Cameras Europe Bridge, Gladbeck Webcams Goethe-St. / Ordinary Road B224. Unique Ruhr Metropolis Airport Webcam with views at the Runway of Private Airport "Loemuehle" (2 camera directions West + East), in the south / east of "Dorsten" and south / west of "Recklinghausen"
German Football World Championsship WM2006 Cities showed Light Routes from the whole Ruhr Valley Area - in Real-Time visually captured in June/July 2006 - and also to view the last year "Handball World Cup" .:. RUHR Cities 2008 live! The Net Cams Location: German innovations are proud to be 'Made in Germany', and so with a proudly presenting "Ruhr" of a living Ruhr Human. Now you may ask "WHO, WHERE OR WHAT IS .. 'RUHR' "??? The Answer of Ruhr is here: "Ruhr" is a multicultural citizens area located in the Continent "Europe" Webcams, Country Map of "Germany", with their outer west situated area "Ruhr". (tedesco cinepresa città mano main WM2006 mundial vivo ciudad cámara Ruhrcities metrópoli Reno Rin / Ruhr Câmeras). Make a journey into this camera portal with realtime air pollution and visibility traffic monitoring where you'll find free live webcams of the largest industrial city of the european West German Metropolitan with Maps and aerial Pictures. Every Ruhr Webcam shows a Look inside one of the Germania Mega Cities on the Ruhr and L'Allemagne Westphalia Metropoles between the rivers Rhine and Ruhr, Lippe and Emscher called 'Ruhr Metropolis'. This Alemania Ruhr Valley Television of Rhin-Ruhr Area represents a huge crowd of citizens and ranges on Nó 45 at worlds largest agglomeration with 5,3 million Inhabitants: See free individual Allemand Metro Cameras live with public city and town views, real time street scenes, details and life pictures live aus Duitsland - the Ruhr secteur ville cctv caméras from the Land North Rhine Westphalia (NRW), also WebView Livescope Webcams from the German Ruhr Mega City Region. Webcam hopping at its best. The Ruhr Valley - Listing Of Cities: Follow is the list of all 53 most important German Ruhr Metropole Area District Cities and Towns from A-X with some yet tested but not always reliable MetroCams: Alpen, Bergkamen, Bochum 1 2 3, Boenen, Bottrop, Breckerfeld, Castrop-Rauxel, Datteln, Dinslaken, Dorsten, wm 2006 webcams Dortmund 1 Friedensplatz, Duisburg, Ennepetal, Essen, Froendenberg, Gelsenkirchen, Gevelsberg, Gladbeck, Hagen, Haltern, Neu: Webcam Hamm, Hamminkeln, Hattingen, Herdecke, Herne, Herten, Holzwickede, Huenxe, Kamen, Kamp-Lintfort, Luenen, Marl, Moers, Muelheim, Neukirchen-Vluyn, Oberhausen 1, Oer-Erkenschwick, Recklinghausen, Rheinberg, Schermbeck, Schwelm, Schwerte, Selm, Sonsbeck, Sprockhoevel, Unna, Voerde, Waltrop, Werne, Wesel, Wetter, Witten, Xanten. More infos about the Ruhr district: Take a look at the municipal association, the Ruhr Unit "KVR"
Don't miss night view over Europe with the Ruhrcity! Various time views from earth by Swiss Fourmilab..